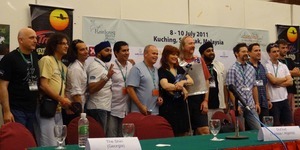 RWMF performers at Friday's media conference. Santubong, Sarawak 8 July 2011. Once again the magic of Sarawak's iconic Rainforest World Music Festival has begun. World music lovers from around the world can look forward to an incredible line-up of world class acts among the 22 bands - the highest in its 14 years of existence. Presented by Sarawak Tourism Board, the RWMF has a reputation for rocking the worlds of concert-goers, folk instrument aficionados and plain fun seekers over three days. Concert line-up staring Friday 8 July 2011: Startijenn (France), the Pacific Curls (New Zealand), Mamak Khadem(Iran), The Blue Canyon Boys (USA), Lisa Haley & The Zydekats (USA), The Shin (Georgia), Iskwew (Canada), Frigg (Finland), Malick Pathe Sow (Senegal), Agungbeat (Malaysia), Masters of the Sape (Malaysia), Victor Valdez Trio (Mexico/Australia), Ilgi (Latvia), Leweton Women's Water Music (Vanuatu), Kamerunga (Australia), Kissmet (India/UK), Paddy Keenan Trio (Ireland), DuOud (Tunisia/Algeria), Joaquin Diaz (Dominican Republic), Kamafei (Italy), Kenge Kenge (Kenya) and Warsaw Village band (Poland) and Masters of the Sarawakian Sape. Bands at the first media conference today shared their views on cultural influences in their music, including the former generation's folk tunes. Lisa Haley, lead singer and fiddler of Lisa Haley and the Zydecats from Louisiana, spoke about taking old music into the new generation to ensure that old traditions do not die out. Her mother was not allowed to speak French in school in the US where "Cajun music was banished to the garage" and she only had the opportunity to perform it much later in high school. A rub-board used by Lisa Haley & the Zydekats played with bottle-openers! The band's neo-traditional zydeco/cajun style is electrifying, known to rouse many to their feet in spontaneous dance, in their many tours worldwide. Her Grammy nominated album "King Cake" is on the Billboard World Chart. Lisa Haley and the Zydecats will perform about 20 songs, mostly original compositions and fast, combining zydeco, cajun and New Orleans styles. If there was a novelty act award, it would most certainly go to the Leweton Women's Water Music. 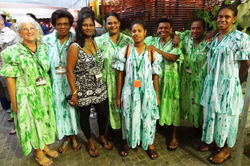 The women from Vanuatu will get incredibly wet entering the calm Santubong cultural center lake to bring wonderful aquatic tones by striking the water on the surface and from within. Too bad I do not have my wet suit and dive gear with me, or I would certainly get underwater to see just how this is being done. "It is also the most environmentally-friendly act, as we burn no carbon in performing, just use our hand power," said a band member. Rainforest World Music Festival has been voted for the second consecutive year as one of the Top 25 Best International Festivals by renowned world music magazine, Songlines. Photos by Mallika Naguran and festival sources. Get down to Santubong, Sarawak for some cool grooves. Check out RWMF website for more details. Watch video of Gaia Discovery's interview with Randy Raine-Reusch here, the festival's artistic and programme director.